Home » Blog » Cloud Video Conferencing and Telehealth; The Future of Healthcare? A decades ago we were still in the infancy stages of telehealth. Technology, and particularly mobile and fixed line broadband, were at a level that could just about support the passage of high quality video content in a real-time flow. Now in 2014 the Internet has got to a level of development that means healthcare organisations and people in their homes can communicate seamlessly, in person, without having to do any travelling. There are a hundreds of telehealth initiatives that have been run throughout the world. Most of them have one characteristic in common: they are trying to save time and money by connecting patients and healthcare practitioners through cloud-based video conferencing systems. It is a fact that in many places around the world doctors are in short supply, the cost of care is increasing, and whole communities are unable to gain access to a decent quality of care. So how far as the technology come? Is there an argument for widespread incorporation of telehealth solutions in the community? Can technology help to take the pressure off the stretched resources in A&E departments? Let’s take a look at some of the current and future implementations of cloud-based video conferencing around the world. A classic example of the use of cloud-based video conferencing in healthcare situation is that of Royal Belfast hospital. The Clark Clinic consults with parents of children with heart conditions over a wide distance. Prior to implementing video conferencing solutions the logistics of getting face time for parents and their children with specialists was a real problem. Dr Casey, consultant paediatric cardiologist, explains that the costs of buying the equipment required for video conferencing have been far outweighed by the cost savings it has provided. He went on to say that being able to share expertise with colleagues and patients outside the hospital, offering quality support, offers incalculable value. The Haiti Medical Education Projects began in 2010, as a response to the destruction of the 4 main teaching hospitals in high tea, and the loss of many medical practitioners due to the earthquakes that wreaked havoc in the country. Lacking medical practitioners, and the facilities to teach, Haiti turned to video conferencing solutions. Implementation of video conferencing in the high tea environment has not been without challenges. Bandwidth and internet stability in the country are notoriously poor. However, the use of video conferencing is has dramatically improved the country’s ability to train medical staff and gets Haitian doctors treating Haitian patients. From 2006 to 2010 Videonations facilitated national meetings for the North West ambulance service. In a bid to reduce escalating travel costs, and lost man-hours, meetings were organised over our cloud-based video conferencing solution. The implementation of this new way of doing things saved both time and money, whilst facilitating rich, productive multi-collaborator meetings. An ambitious project over in Third World Nigeria has been seeking to implement a video conferencing system to overcome the many healthcare challenges in the country. 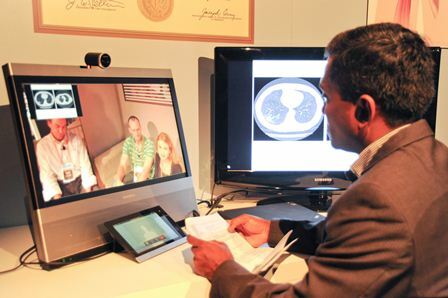 video conferencing will be used to connect up professionals in teaching hospitals with more remote medical centres, where medical expertise is less available. In addition, experts and consultants around the world will consult with less experienced professionals in Nigeria to advise on rare conditions. The unique thing about Alesam in Nigeria is that physiological readings are also being passed from patients to medical practitioners at the same time as the video conference occurs. The physiological measures are used to do an ABC diagnosis. The system also collects medical information for National statistics, health data and resource planning. At this stage Alesam are consulting with the Ministry of Health on the project. If it moves forwards it will be perhaps the most all-encompassing implementation of video conferencing and telehealth in the world, and could be a model for the future in other Third World and developed countries. The Future: A Healthcare Revolution? It is clear from these and the many other case studies in the UK, and around the world, that video conferencing has a key role to play now and in the future. With smart phones and tablets arriving in a timely fashion onto the market, and gaining popularity, much of the infrastructure required for cloud-based video conferencing is already owned by medical establishments and patients alike. How far video conferencing will become integrated with the healthcare system is yet to be seen. It is clear, however, that there are financial and treatment benefits to using this technology. The Nigerian case study is perhaps the most ambitious to date. All-encompassing telehealth solutions, with real-time data and interconnection of medical colleagues and patients looks to be the future. Perhaps the biggest challenge to the implementation of telehealth is the current infrastructure. In the UK, for example, we can’t just throw everything away and start again. The GP consortia will each look at their own solutions. Likewise hospitals will go their own way with technology. The reality is that the cost of implementing video conferencing solutions, and sending triage and other data over the Internet, are not that great. The technology is largely in place. As medical practitioners and the general public become more technology savvy it seems only a matter of time before the training and transition costs of implementing remote solutions are so low that a revolution in health care will be inevitable.